Ring PowerPoint Diagram template is a free PPT template with two nice slide designs that we can use to make awesome PowerPoint presentations with nice graphics. You can download this free rings diagram for PowerPoint to enhance your business presentations and decorate your slides with awesome PowerPoint diagrams. 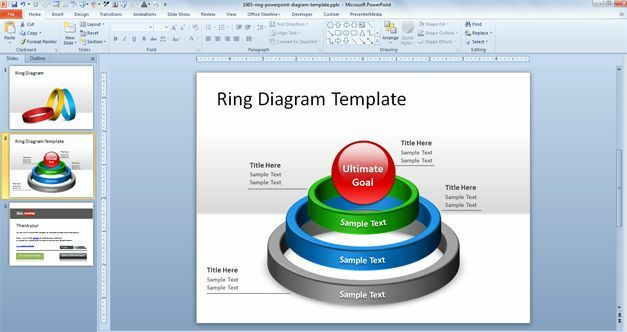 Download free ring PPT template and 3D ring diagrams to decorate your slides. For example, you can use this ring PowerPoint template to make a multi-level PowerPoint diagram as an alternative to other SmartArt graphics and PowerPoint diagrams. 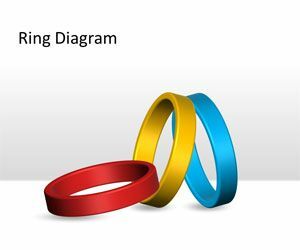 Free Ring PowerPoint Diagram template contains two different slides with 3D rings shapes. You can edit the rings and add more rings by copying and paste the rings into the slides. For example, the ring diagram template used in the second slide can be used to describe the ultimate goals of your organization based on the corporate strategy plan.